In case you have not noticed, change has come upon the WWE. For years everyone has said, that the company was the land of the giants, indy guys would never make it, and legends who felt they were done wrong would never return. But there have been so many things that has transpired in the WWE, that makes you look twice. Is this the same company we grew up watching? 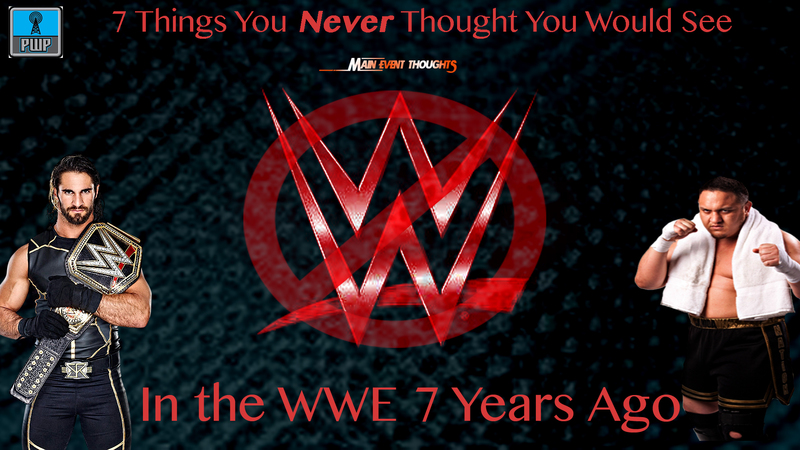 Here are 7 things that you never thought you would see in the WWE, 7 years ago. Bruno Sammartino is a legend. He is the longest reigning WWE Champion in history. Just like Joe DiMaggio’s 56-game hitting streak, it is a record that many feel will never be broken. After Bruno left the WWE, he and Vince McMahon had a disagreement, and Bruno was not a fan of what the WWE had become. He wanted nothing to do with the company. But in 2013, that all changed. After a conversation with Triple H, Bruno was convinced of the direction that the WWE was heading in and he welcomed the honor of being inducted into the Hall of Fame. Like Bruno, the Ultimate Warrior was also a legend. He was the first man to defeat Hulk Hogan clean at WrestleMania. Warrior had many disagreements with the WWE throughout his time there, but after 1996, he never wrestled for the company again. 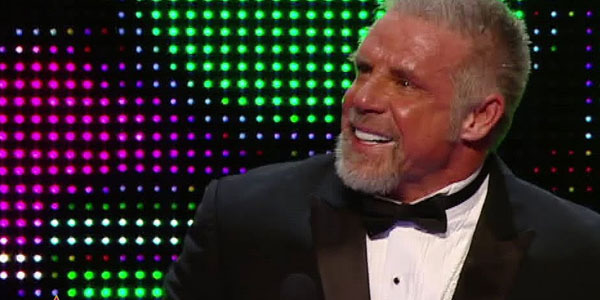 In 2005, WWE released a DVD titled, The Self Destruction of the Ultimate Warrior. On this DVD, everything that everyone had to say was negative. They discussed some of his antics that went on backstage even going as far as saying that he was not a good worker. Who in the world would be able to convince Warrior to come back after this? One person, Linda McMahon, the two had a special bond that only the two of them understand. Warrior was inducted in the 2014 Hall of Fame. Thankfully this relationship was repaired. Warrior tragically died three days after his induction. Bret Hart and Shawn Michaels hug in a WWE ring. The year, 1997; the event, Survivor Series; the location, Montreal Canada. On this night, Bret Hart and Shawn Michaels faced each other for the very last time. Bret was champion, but was leaving for WCW, Shawn was the guy Vince wanted to win the title. Bret did not want to drop the title (chances are if you are reading, you know the story). After losing the title, Bret spit in the face of Vince McMahon, and backstage he and Shawn argued backstage and Shawn swore he had nothing to do with it. The two had their issues that began after Bret put Shawn over at WrestleMania XII and Shawn did not return the favor at WrestleMania XIII. Everyone believes he faked a knee injury. In January 2010, everything changed and the two had embraced in a hug in the middle of the ring. WWE has always been the land of the giants. When Bret Hart became champion in 1992, he became the pioneer for the smaller guys. After the Bret and Shawn, the face of the company was always someone over 250 pounds or more. But in 2011, CM Punk dropped a pipe bomb that changed his career, and helped advance the company. Punk held the title for 434 days, and proved that “smaller guys” could make it. Daniel Bryan lead the revolutionary YES Movement. And after Brock Lesnar held the title for 6 1/2 months, the new face of the company is Seth Rollins. Before, promoters would tell guys, WWE does not want smaller guys, but can they really say that now? If you are a fan of women’s wrestling, the WWE women’s division has been frustrating for awhile. You look at the independent circuit and see companies such as Shimmer, WSU, and Shine, and you are treated with some of the best wrestling. When you watch TNA, their Knockouts division found a way to show a good mix of the women’s good looks and wrestling skills. During the mid 2000s, it was all about the Diva and Diva search. The wrestling was secondary. In 2011, Awesome Kong made her WWE debut as Kharma, and everyone knew that the division would be solidified. But she got pregnant shortly after signing. After losing her baby tragically, it was reported that she was not psychologically ready for the WWE lifestyle. Since the evolvement of NXT, women’s wrestling has been looked at in an entirely different light. Fans are seeing some of their favorites such as Paige, Charlotte and Sasha Banks, who are wrestlers first, good looking women second. Because of this, the women on the main roster are taking things to the next level. We saw Trish Stratus and Lita main event raw. It will be a manner of time before we see two more divas do the same. He was the face of WCW. When Vince McMahon purchased WCW in 2001, Sting was the one guy who everyone wanted to see. Sting feared how he would by the company. The last thing he wanted was to be overlooked and buried. Hulk Hogan and Ric Flair have gone on record saying that they always told Sting he needed to work with McMahon. Sting returned to wrestling in 2006, but it was in TNA. He won championships there, but wrestling fans were not satisfied. They wanted him in a WWE ring. In 2014, he did not renew his contract with TNA, and fans began to plead that if it is not too late, could we get one night of Sting in a WWE ring. At the Survivor Series, the lights went out just as Seth Rollins and Triple H were about steal a victory. The music came on and out came the vigilante. Sting appeared and confronted Triple H. After taking out the C.O.O, Sting helped Ziggler get the victory that would eliminate The Authority. This led to Triple H and Sting at WrestleMania 31. Yes, Sting at WrestleMania. Yes he is Samoa Joe! Seth Rollins, Cesaro, and Daniel Bryan are examples of guys who dominated the Independent circuit and wrestled all over the world, but when they came to WWE, there name was changed. There is no Tyler Black, Claudio Castagnoli, or Brian Danielson headlining WWE PPVs. But on NXT Takeover Unstoppable, after the main event between Kevin Owens and Sami Zayn (formerly Kevin Steen and El Generico) Samoa Joe showed up, and he had a t-shirt that said “Samoa Joe!” It even had a NXT logo on it. That right there solidified the fact that he would be the guy who wrestling fans love! What is going on in WWE, one of our favorites gets to keep his name!